Columnea moesta has the characteristic small flowers of the Section. 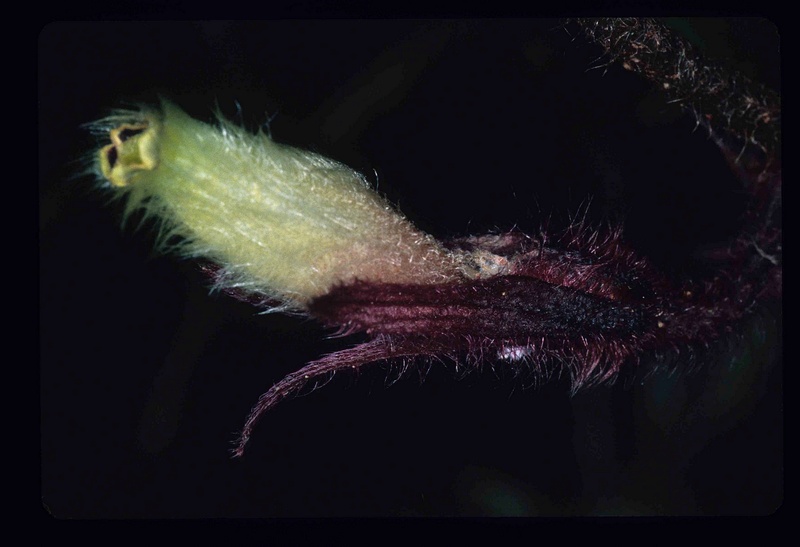 These species are characteristically slender herbs with narrow corolla tubes that are not bilabiate (the smaller flowered species of the Wiehler genus Pentadenia). This trait is also shared with the recently described section Angustiflorae (see below) and prior to a molecular study that sampled nearly all species of section Stygnanthe, were thought to be part of a single evolutionary unit. The single best diagnostic character to separate section Stygnanthe from Angustiflorae is the ratio of corolla tube length to lobe length, which is 8.3-18.0 in Stygnanthe, and 2.9-6.8 in Angustiflorae. A species that characterizes this section is C. moesta. Most species in this clade are poorly known and rarely in cultivation. Most are also terrestrial rather than epiphytic.